Launch week: Karma Brown Takes Deb Ball Interview + a Giveaway! I’m now a four-day-old published author, and am still in that place where I can’t believe I have a book out in the wild. On the shelf. In readers hands. The other Debs have tried to tell me what it’s like, the days after publication, but it truly is one of those things you need to experience to understand. I am exhilarated. And a little drained. And slightly obsessed with Amazon, which I hope is only a temporary ailment. But above all else, I’m tickled to be here, and fingers crossed, I get to stay a long, long time. Getting babies to go to sleep. I have a knack to taking a babe in my arms – even a screaming one – and with a few rocks and rolls of the hips and some shushing, to watch their little eyelids close within moments. But then I had my own baby and I learned it’s only a superpower I possess with OTHER PEOPLE’S BABIES. My kiddo never napped, would much rather craft or play or read or do puzzles than go to sleep, and so it turned out to not be a super helpful superpower after all! Because my child is an early riser, I have come (been trained) to love the morning. And by morning I don’t mean when most rise with a yawn with just enough time to get ready for work or school – I mean 5 a.m. early. It’s quiet, and peaceful, and to me there’s nothing better or more inspiring than an almost-awake sky, a large mug of coffee, and my laptop. I can be a perfectionist in many ways, and have made Tinkerbell, Queen Elsa, and seven-layer rainbow birthday cakes, but Pinterest always makes me feel like I’m not striving hard enough. So one thing guaranteed to make me cry laugh are birthday cake or recipe fails. Whenever I need a boost I Google “Nailed it + Pinterest” and settle in. And if that doesn’t work, Damn You Auto Correct! gets me every time. GIVEAWAY: Comment on this post by Noon (EST) on Friday, September 4th to win a signed copy of COME AWAY WITH ME! Follow The Debutante Ball on Facebook and Twitter for extra entries—just mention that you did so in your comments. We’ll choose and contact the winner on Friday. Good luck! Congratulations! I’m sure you’re on Cloud 9! Karma, a big congratulations to you, I can just imagine your excitement! The title Come Away With Me is so inviting….I would love to win the giveaway and will mention it on FB and Twitter, also I love reading Debutante Ball! l Happy Launch week, can’t wait to read your book! Congrats! I also can’t chill! 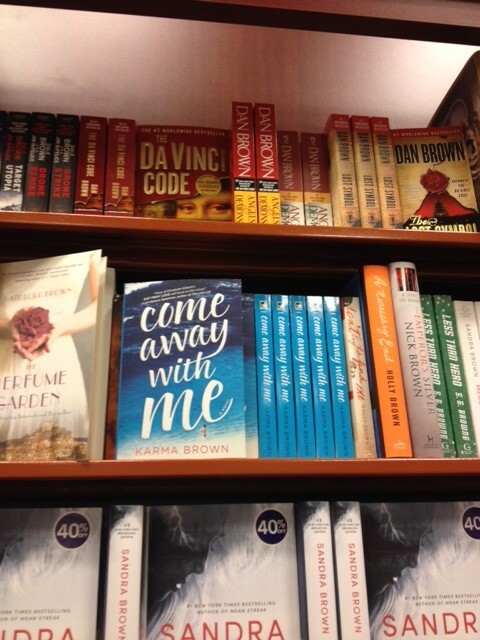 I already purchased Come Away with Me as soon as I first read it about it. I’m lovin it! It would be great to win the autographed copy. I’ll be waiting for your next book. Thanks, Mitzi — So glad to hear from others who can’t chill 🙂 And thanks for buying and reading Come Away with Me — happy to hear you’re loving it! I am also an early riser and love my quiet time before everyone else gets up. 🙂 I am so excited for you and your big release! This topic of your book rings really close to home for me. Karma I wish you many, many great sales for this book.. Congrats. Congratulations! I know about being the baby whisperer. When it comes to other babies, my husband and I can help them fall asleep. We take care of our grandson. His parents marvel on how we do it. I tell them that it was rough at first when we started out but then you learn to relax. 🙂 I follow The Debutante Ball on both facebook and twitter. It looks like your talent doesn’t stop at writing, if you made those cupcakes, I’m very impressed. Congrats to you on your debut week! I think you’re right on the whole ‘smell our fear’ thing, Jill! And no, I did not make the cupcakes … those are an internet gift. But the rainbow cake was all our doing, for our daughter’s 7th bday. It took an entire day! Thanks so much for the giveaway! I’m excited! I’ve heard rave reviews on this book! Can’t wait to read it, and congrats Karma on your debut novel! Congratulations Karma! This is such a huge step! I adore cakefails – I spend far too much time there but they always make me laugh. Congrats on your debut! It’s one of those books that makes me want to read it just b/c the cover is so beautiful! My son never slept either. He had “pure” colic (according to his doctor). Only running the vacuum could stop his crying. Even as he grew out of the colic, he never went to bed at 8pm like other people’s children. But he outgrew the crying — never threw a toddler tantrum or cried over babysitters, etc..